Francis Gale Snelling Street was the first doctor in Bow employed by the Crediton Union in 1836. He was born in Exeter, the son of Thomas Street, a surgeon. 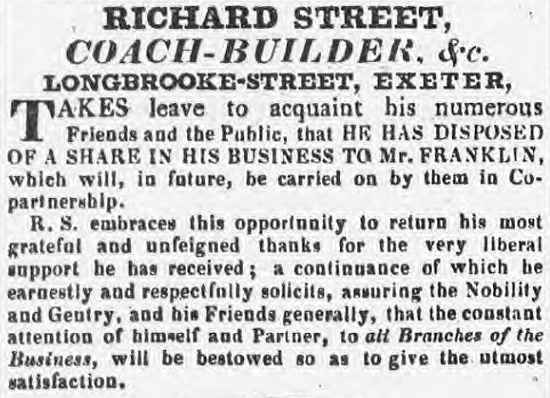 Some of his family in Exeter caused a little notoriety in the 1820s. Francis GS Street’s cousin, Richard Street, was born in Exeter in 1783. Richard had been apprenticed to Benjamin Hill, a carriage maker in Longbrook St. After Hill died in 1803, Richard had an affair with Hill’s widow, Drusilla, and took over the business. [Drusilla Hill nee Elston had been born in Morchard Bishop in 1770.] Drusilla became pregnant and gave birth to Richard’s illegitimate daughter. Shortly after her birth the couple married in St David's church; even so the child was baptised there as Drusilla Hill five days later, on 2 Feb 1807. On the death in 1812 of her grandfather, Josias Elston of Morchard Bishop, young Drusilla inherited £400 This was likely held in trust for her until she was 21 or married. In 1821, when she was 14, her father had her made a Ward of Court, to protect her from suitors out to marry her for her money. At the end of June 1822, when Drusilla was 15 years and five months old, her father obtained an injunction from the Lord Chancellor forbidding one Horatio Reeves from having any communication with her. He also alleged that her mother was encouraging her to enter a relationship. 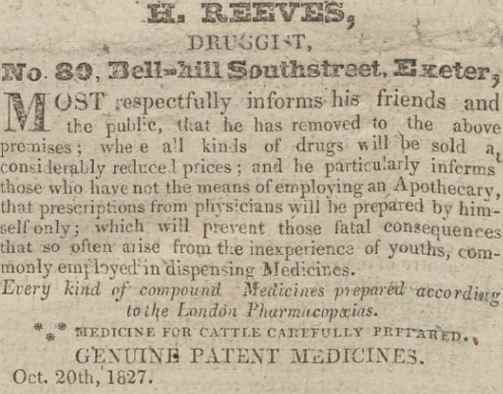 Horatio Reeves was 21, the son of an Exeter pawnbroker, and was a druggist in that city. Within a couple of weeks of the injunction, however, the couple managed to elope by coach via Bristol to London with the assistance of Horatio’s elder brother George. As Horatio was in breach of the injunction, warrants for his arrest were issued. They were taken to the courts. Miss Hill was returned to Exeter and the brothers Reeves were remanded. At the end of July they were both committed to Fleet prison for contempt, and the mother was banned from communicating with her daughter. August 1822: At the Guildhall, Exeter, on Friday, a serious charge was made before the Right Worshipful the Mayor, against Mrs. Street, the mother of Miss Drusilla Street, of an attempt to poison her husband, previous to the elopement of which the public have lately heard so much. — John Bennett, shoemaker, in St. Sidwell’s, deposed, that he called on the defendant to borrow 7s. She said she could put him in the way to get 20 pounds; he asked how, and she replied, "By poisoning my rogue of a husband." She showed him some white stuff, mixed up in a tea-cup, which she said was arsenic she got to poison rats with, but she did not think it was strong enough, and gave him money to go to Mr. Reeve's to buy some more. He went and asked for some arsenic to poison rats: Mr. R. told him nux vomica [strychnine] was better, and gave him some. While this deposition was making, the defendant cried bitterly, and exclaimed — “Lord have mercy upon me!" — A conversation then took place between the Counsel and Attorneys, on the amount of bail necessary. Mr. Street said he feared he should be obliged to leave Exeter, to be safe from his wife. Mrs. Street (in great agony), “I won't injure him — l won't injure him a pin's point." It was ultimately agreed to take the bail of two persons in £200 each, for her appearance at the Sessions to answer the charge. In October that year, at the assizes, no bill of indictment was preferred against Mrs. Drusilla Street, on a charge for attempting to bribe John Bennett to administer poison to her husband Richard Street. In November Horatio was released from Fleet Prison. In February 1823 in the Consistorial Court in Exeter Drusilla Street obtained a divorce from Richard on grounds of his adultery. He was ordered to pay her £160 per annum plus some property rental income. Richard Street unsuccessfully appealed to the Court of Arches, on the grounds that his income was only about £500, and that he had to pay £200 per year for his daughter’s education and maintenance. He sold part of his business. In August that year Drusilla unsuccessfully applied to the court to prevent Richard from leaving the country as it was said he was planning to go to Ostend to get out of paying maintenance. Richard Street wrote his will in May 1824 – specifying that Drusilla would get nothing if she was to ever marry Horatio Reeves, in which case her inheritance would go to Richard’s brother William. Richard died the following October. As soon as she was 21, Drusilla Elston Hill and Horatio Reeves, at that time a druggist and grocer in South Street, Exeter, were married on 2 May 1828 at the Exeter church of Saint Mary Major. In 1832 Drusilla’s mother died and as requested in her will was buried back at Morchard Bishop. Horatio and Drusilla lived in Exmouth. In 1841 they had a servant, 21 year old Charlotte Lovell. She gave birth to a daughter Mary Ann in Glastonbury in 1844. Mary Ann later emigrated to Australia where she documented her parents as Horatio Lovell, a chemist, and Charlotte Reeves. It looks highly probable that Horatio Reeves was the father. Horatio was a part owner of the schooner “Exmouth” and around 1846 he was a coal merchant there. In 1857 he was appointed “inspector of nuisances” for Exmouth board of Health. In 1868 on Dec. 4, at the Parade, Exmouth, Drusilla, the beloved wife of Horatio Reeves, after enduring a long and painful illness with Christian fortitude, died aged 62 years. They had lived together for 40 years. Horatio later moved to live with his brother, a horse riding instructor in Torquay, where he died in 1885 aged 84. One of Horatio’s brothers, John Reeves, was a surgeon oculist. 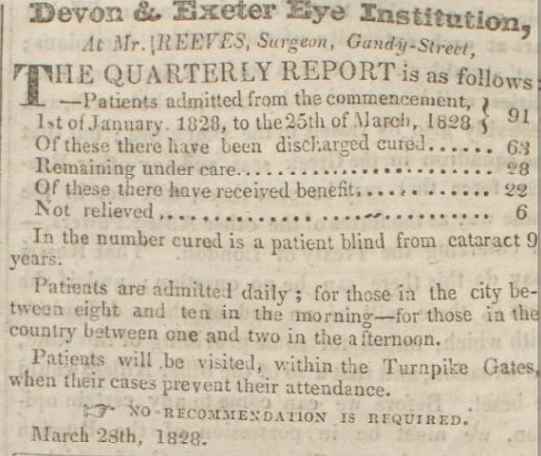 In 1828 he set up the Devon and Exeter Eye Institution at his house in Gandy Street. This seems to have lasted less than a year, as it was in competition with the West of England Eye Infirmary, which had already been established for 20 years. He died in 1840 in Campbell Town, New Brunswick, of “a blood vessel which bursted in his lung”, leaving a widow and three young children.